At Whimsical Gifts, you’ll find beautiful gifts that speak to each of your loved ones. Our collection of fashion accessories include watches and jewelry items that feature different types of sports, hobbies, holidays, occupations and other interests. We carry a huge variety of unique gold and silver charms for bracelets and necklaces, and every single charm is hand painted in meticulous detail. These handcrafted bracelet and necklace charms even feature lobster-claw clasps for easy and convenient attachment. 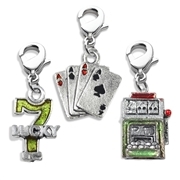 Our personalized jewelry charms are big favorites for teens in particular, but they’re definitely enjoyed among all ages. By shopping for handmade novelty charms here, you can gift something truly meaningful to the artists, teachers, dog lovers and shopaholics in your life. There’s something for everyone! Order a few jewelry charms that represents the receiver well, and we’ll ship them out to you in a lovely gift box along with a one-year warranty. Feel free to call us at 877-324-0845 if you have any questions about our accessories!